While most people generally believe that sports only teach you how to win games or be physically strong, I believe sports have a far greater impact on your life. They help you develop real-world skills that can be applied to all areas of your life. Listed are some important life lessons basketball can teach you. Although I’m sure that these life lessons can be acquired through any sport, I have related these skills to basketball. It is the same with any other field in life. If you want to get better at school or get a raise at your workplace, the only way you can do it is by hard work. There are no shortcuts to this. We are always taught to dream big but what we don’t realize most often is that our dreams don’t work unless we do. There is no substitute to hard work, ever. In the sport of basketball, you cannot succeed unless you believe in yourself and your teammates. It is this belief that gives you confidence. You must believe you will make that crucial free throw or make the buzzer-beater, which will win you the game. That is the first step to move forward. Similarly in life, you must believe in yourself. You must have faith in your abilities. Without this belief and faith in your capabilities, you cannot be successful or happy. Basketball is a team sport and unless each player plays his/her role and contributes for the benefit of the team as a whole, it is not possible to win. Coordination and teamwork is an essential part of any team. Sports teach you to overcome adversity. What might, in your opinion, be a wrong call by the referee may cost you a game or your key players might injure themselves before an important game and upset your game plan. In such situations you learn to overcome adversity and temporary failures. For a sportsperson, discipline is essential. Discipline is the bridge between goals and accomplishment. Even at this level, the current NBA MVP (Most Valuable Player), Stephen Curry, has to pay 100 dollars for every turnover (after three turnovers in a game) to his mother. His mother came up with this idea because of one recurring weakness: his high turnover numbers. Learning discipline will help throughout your life, whether it’s studying every day for a test or doing your work ahead of time. To be extraordinary all you need is discipline. Excuses don’t work (no matter how ‘valid’ they are). In order to balance sports and other activities, you have to make certain sacrifices. This, for me, would mean cutting down on leisure so that I can balance studies and sport. A lot of time management is involved here too. In life too, nothing worth having comes easy. Sacrifices need to be made at every step in order to achieve what you aspire to. Through sports you learn how to do this and how to utilize your time for your greater good. Playing a sport involves both wins and losses. You learn to be proud of your success without demeaning your opponents. You learn to accept failures with grace and come back stronger next time. With time you realize it’s not really the win or loss that makes a difference. If you give it everything you’ve got, no matter what the outcome, you can walk away with your head held high. In life too, everything does not always go your way. There are highs and lows but if you continue to give whatever you do your very best you will ultimately emerge triumphant. In basketball, you are taught to never give up. A few minutes can change the game. Even on days when your shots just don’t go in you have to keep trying and helping your team in other areas. You need to contribute in the defense, go after loose balls, make good passes and help in any way you can. You can never give up – not on the game, not on your team, not on yourself. You keep trying till the very last second. Even injury should not be a reason you give up. I can tell from personal experience that injuries have made me stronger. In life too, there will be a million occasions where you will want to take the easy way out and give up. But you need to hold on and brave the storm. This is what we learn from sports – to never give up. In basketball sometimes you have to step up, you have to take the decision to make the game-winning shot in a close game. You have to take charge of the situation. You have to take responsibility to stop that shot to avoid overtime in the final seconds of the game. In life too, you have to take charge for your own actions. You need to be responsible for your own dealings. Sports make you better equipped to handle your problems and take charge. Through sports you learn to respect – your coach, your teammates, the referee and even your opponents. You learn to acknowledge that sometimes your opponent might be better. You learn that without respect winning doesn’t mean anything. You learn to never put another player down. In life, without respecting others you cannot get anywhere. Strong people never put others down; they lift them up. Sports teach you just that. Criticism is a natural part of leadership. If no one is criticizing your leadership – you are not leading correctly. Leadership is not a popularity contest. Leadership is about always doing what is in the best interest of the organization you are serving. Leaders get paid to make the difficult decisions. But many leaders don’t really know how to lead; they waste time trying to satisfy the agendas of others – rather than focusing on the goals and objectives of the organization and people they serve. Leadership requires mental toughness. If you are not being criticized, you are not leading and guiding the organization to grow, innovate and explore endless possibilities. You need to be strong and objective to whatever criticism people throw your way. Much of what ultimately happens is out of your direct control. However, if you can see what others don’t and anticipate the unexpected — as a leader you will find ways to influence outcomes that benefit those you serve. Effective leaders stay focused on confronting conflict head on – and move on to the next opportunity. When you get too personally vested, it becomes difficult to handle criticism and you eventually become stereotyped and your authority weakens. You lose momentum as you begin to make poor decisions trying to reestablish and validate your leadership to yourself and others. As you find success in your leadership journey, some people will try to take you down. The leaches and loafers that are envious of your success may attempt to slow down your momentum. This is actually a sign that you are on the right path. Being a 21st century leader requires you to be a change agent and people don’t like to change. As you lean-into the challenges and new opportunities that come with them, remember that criticism is a natural process of the leadership journey. Since criticism is never easy to handle, keep the following four ways in mind to ensure you handle it wisely. When criticism strikes, never take on a “woe’s me” attitude. People find it difficult to respect a leader who becomes the victim. The victimization mentality is not a leadership trait, but rather represents an individual that lacks the mental fortitude and composure to be in a leadership role. When leaders play to the victim narrative, it exposes their lack of maturity and doubt rapidly begins to enter the minds of those they lead about their ability to endure the pressure, intensity and uncertainty. Rather than play the victim, own the criticism and convert it into new opportunities previously unseen. Be a change agent and turn the negativity into a platform to enable growth, innovation and endless possibilities. When faced with criticism, step back and assess the situation. Be patient, don’t react impulsively. Too many leaders get defensive, focus more on their reputation and overreact, rather than evaluate the situation at hand. Adversity my make or break you, but it primarily reveals you. Leaders must practice patience when faced with criticism and show a high level of composure and executive presence. Criticism comes and goes. How well you lead through it is what earns you respect from your peers. I’ve been advised by my mentors not to care so much what people say. This does not imply that I shouldn’t work hard or perform at my highest levels – it refers to the importance of not taking criticism personally. As a leader, you must be mindful not to get overly attached to the business and the issues at hand. When you take criticism too personally, it becomes more difficult to be objective towards meeting the needs of the business and the people you lead. Leadership is not easy and handling criticism is an unwritten rule in the job description. It happens often and if you lead to win, advance others and the organization you serve – you should expect criticism and know how to handle it. Those leaders that take it personally will find their leadership role short lived. Criticism is another way of saying “learning moments.” Though you can never be perfect when leading, you must be open-minded enough to course correct along the way. Leadership requires you to pivot, renew and reinvent yourself. Though you may have experienced success in the past, leadership requires you to invest in yourself so that you can become a better, faster and more fluid change agent. Great leaders and their organizations are often criticized. As the saying goes, “It’s difficult to get to the top, but even harder to stay there.” Why is it harder to stay on top? Because it’s easy to grow complacent – and it’s difficult to endure the critics that don’t believe you’ve earned the right to be there in the first place. Staying focused is critical when you are a leader and diffusing the noise by staying focused on the next level of evolution in your business will help you shut down your critics. One of the most important qualities of leadership is being a good listener. And that applies just as much, if not more, when you are being criticized. Don’t try to shut it down. In fact, turn up the volume and really listen to what is being said. Too many times leaders turn the criticism around on the person speaking up, instead of seeing it as an opportunity to learn from someone else. Listening to criticism is a leadership responsibility that does not appear in the job description, but it can make you a more effective and trustworthy leader if you handle it constructively. A player is not the only one that makes mistakes. Coaches make many mistakes every day, even though most of them are not noticed. A costly mistake by a coach can be the difference between winning and losing. It also can lead to an underachieving, dysfunctional team. The three most costly mistakes of coaches are highlighted in this article. Coaching basketball these days at any level is a very difficult job. Many books are written about successful qualities of excellent coaches and leaders. Most coaches will not take a deep look into their own coaching ability to discover their weaknesses. If you are serious about your coaching ability, take an objective look at the factors that keep you from reaching your potential. What are your three areas of concentration in coaching? If your practice was observed for 30 minutes, would your Top 3 be easily identified? Why is this such an important part of coaching? Having a Top 3 given your coaching and your program the direction and clarity it needs. If your drills, terminology, practice, and daily focus are tied directly to your Top 3, your players will execute at a high level and time will be greatly maximized. If your coaching or your program are without a Top 3, you are like a ship in the ocean without a map, compass or rudder. You will try hard every day, but you will not consistently travel the path to success. The Top 3 is the key to successful basketball coaching, consistent winning, and program development. Priority Imbalance—I have yet to meet a coach that said his family, parents, or significant other was not his Number 1 priority in life. This commitment is repeated so much we all begin to believe it after a while! This is “coaching blindness” at its best. I call it the “Coaches Biggest Lie”. Coaches confuse provision with priority. The paycheck that arrives home each month is important for all of us. This check, though, in no way means that by supporting our loved ones financially we have given them top priority in our life. We say they are important but rarely find the kind of quality time and communication needed, especially during the season. To illustrate this point, it is said that time is the true test of our priorities. The things we spend most time on we value the most. It is a cut and dry proposition. Do you spend more time at work or with basketball than your family? Do you carry your job home with you and pretend to be present when your mind is elsewhere? Do you work as hard satisfying your wife’s needs as you do preparing for practice or games? What do you do with your free time; spend it on selfish pursuits or with family or friends? How many hours a week do you watch television as compared to quality time with your family? Do you know the name of your children’s teachers at school better than your next opponent? Do you feel that you have to watch tape at home at night? How often do you tell your loved ones why they are your loved ones? Paralysis by Analysis—Coaches are famous for analyzing the game to the point of exhaustion. Many times we are the only ones who truly understand what is being taught. The philosophy, “Keep it Simple Stupid” gets massive lip service from coaches. This is a tough battle for most coaches, including myself. Our insecurity often leads to a catalog of drills, offenses and defenses that stagger the mind of young players. We stuff file cabinets with thousands of keys, teaching points, and magic late game plays. The knowledge well gets bigger and deeper by the year. At this point it is very important to ask a question: What is the goal of coaching? I believe the answer to this question is execution. Coaching is the task of getting your players to play the game and execute the way you want them to. At its purest level, getting players to execute what you have taught and drilled them is the key. Some have said that execution is doing what you are suppose to do, when to do it, and with the greatest effort. If all of this is valid, simplicity is the only way to success. Do your players know your Top 3 as a coach? Do your players know exactly what they must do to get on the floor? Do your players know exactly what they must do to stay on the floor? To do justice to your own coaching, ask your players these three questions? The answers will provide a map for the future of your coaching. Are you a confusing coach to play for? If so, humble yourself and step back for a while. Carefully analyze your coaching approach and philosophy and get the opinion of assistants, administrators, and players. What seems like weakness can actually be the strength of your coaching! Congratulations to all coaches that take on this challenge. Please share your results with me and make next season your best one ever! Strong team players are the backbone of any team. When others fail, these are the people who venture on with strong resolve and persistence, committed to getting the job done. Most people can list the qualities without struggling too hard, but do you know what qualities great team players share? Always reliable. A great team player is constantly reliable day in and day out, not just some of the time. You can count on them to get the job done, meet deadlines, keep their word and provide consistent quality work. With excellent performance, organization and follow-through on tasks they develop positive work relationships with team members and keep the team on track. Communicates with confidence. Good team players might silently get the work done but shy away from speaking up and speaking often. Great team players communicate their ideas honestly and clearly and respect the views and opinions of others on the team. Clear, effective communication done constructively and respectfully is the key to getting heard. Does more than asked. While getting the work done and doing your fair share is expected of good team players, great team players know that taking risks, stepping outside their comfort zones, and coming up with creative ideas is what it’ll take to get ahead. Taking on more responsibilities and extra initiative sets them apart from others on the team. Adapts quickly and easily. Great team players don’t passively sit on the sideline and see change happen; they adapt to changing situations and often drive positive change themselves. They don’t get stressed or complain but are flexible in finding their feet in whatever is thrown their way. Displays genuine commitment. Good team players are happy to work 9-5 (work hard in sports) and receive their paycheck at the end of the month (receive playing times and get Wins). Great team players take the time to make positive work relationships with other team members a priority and display a genuine passion and commitment toward their team. They come to work with the commitment of giving it 110% and expect others on the team to do the same. To be a great team player, you don’t have to be extroverted or indulge in self-promotion. In fact, great team players sport all kinds of personalities. You just need to be an active participant and do more than your job title states. Put the team’s objectives above yours and take the initiative to get things done without waiting to be asked. In return you will build positive perception, gain more visibility, and develop influential connections to get ahead in your career. In our society, this struggle between being and doing starts early and is often innocently encouraged. We ask our children what they want to be when they grow up, which really means what they want to do. If they love animals, we’re not surprised when they tell us they want to be veterinarians. Some children aspire to be bankers, or professional athletes, or the next American Idol, or an Olympic gold-medal winner. Maybe they want to make lots of money , or live in a big house, or have more cars than they can drive at one time. Great dreams—but they are all related to doing, not being. Those dreams tell us nothing about who our children are, or want to be, inside—what their values and priorities are—those things that will guide them through all of the things they will do. I believe we all struggle with this, but it seems to me that it may even be a greater challenge for men. That may simply be because I am a man and have struggled with this trap as much as any. That’s my disclaimer. Men feel pressured to tie their personal value to their career. Paul talks about the fruit of the Spirit in Galatians 5:22-23—“love, joy, peace, patience, kindness, goodness, faithfulness, gentleness, and self-control.” Yet we rarely embrace these inner qualities because they don’t seem to fit within the world of competitive sports or business. Too often, we believe that a man’s value is determined solely by his achievements and measured against the standards of a world that pays homage to winning . Unfortunately, many of our players feel this pressure as well—deriving their value from what they do and what they accomplish. They confuse what they do for a living with who they really are inside. Once they’re done with football, they aren’t sure who they are. For better or worse, they have the rest of their lives to figure it out. Sadly, for better or worse doesn’t always apply to their marriages. A staggering number end in divorce . My guess is that many of the players don’t have that clear sense of self when they’re done playing football, compounded by the fact that their wives may have fallen in love with their husband’s high profile role and lifestyle. Whatever the case, their careers have come to define them, and when they are no longer involved in football, they simply don’t know who they are deep down inside. A negative job review or worse yet, getting fired, can be devastating. I’ve been there. Though it is understandably traumatic, it doesn’t have to be defining. I hope you’ll never go through it, but the odds are that you will. If you do, take a step back and remember that you’re not the first person to experience this. Your career is not you. It should not, and does not, define who you are as a person. Every day in my line of work, I receive performance evaluations, often by people completely unqualified to give them. Though I must admit that I don’t listen to much talk radio, I decided long ago that I would analyze the criticisms from my superiors, players, assistant coaches, and even sportswriters for things that might be helpful. Trying to constantly improve means being open to learning throughout your life. I also realize that I can’t control what is said, and I will not let harsh criticism affect my sense of who I am. People are free to criticize all they like (sometimes they seem to like it too much, especially when I had done something questionable in a loss), but I don’t let it negatively impact me. I know that I was created by God with all of my strengths and limitations. Somebody pointing out my limitations, real or otherwise, doesn’t change my strengths or the truth that I am and will always remain a child of God. Being versus doing—distinguishing between them will make all the difference in the lives we live. 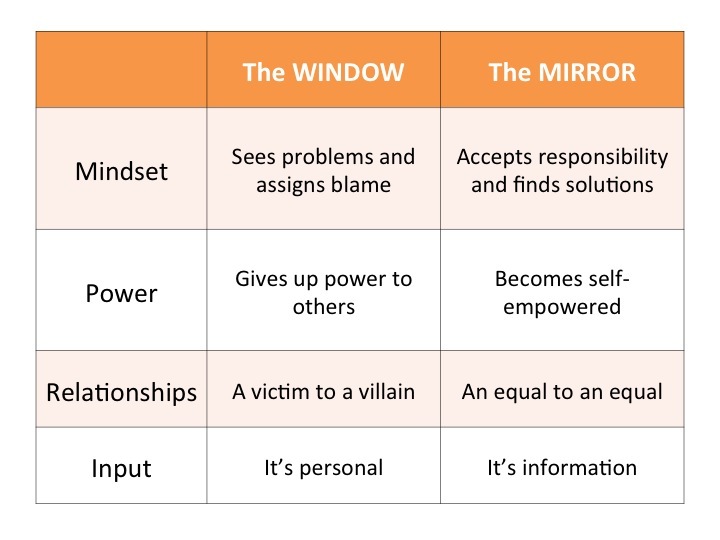 Are You a Window or a Mirror? A window and a mirror are both made of glass, have a frame around them, and are used for seeing things. But they have two totally different functions. You look through a window to the world outside, and you look into a mirror at yourself. I have found that there are two totally different kinds of people when it comes to life and leadership. There are externally focused people, window people, who look outside at others passing them by; and there are internally focused people, mirror people, who look inside themselves for the solutions they need to move forward. Do you assign blame or find solutions? Do you give up power or do you become self-empowered? The great irony of being a window person is that you think you’re so smart, sitting smugly on the sidelines cynically criticizing the work of others. But that’s a position of powerlessness. Quite simply, when you’re not involved in finding solutions, you give up your power to others whom you have no ability to control. You are at their mercy. By looking into the mirror, internally focused people see the one thing they can control: themselves. And by controlling their response in any situation, they become self-empowered in every situation. Few things can stand in the way of a self-empowered person. Do you approach issues as a victim or as an equal? Lack of power and control, then, makes a window person a victim, and all victims, by definition, have villains. Instead of working with other people just like you who are trying to do their best, you view yourself as working with sinister people who are out to get you. This point of view poisons your relationships. Mirror people bring confidence and strength to their relationships. They don’t play the victim, but approach others as respected peers, an equal to an equal. Even in a bad situation, they believe the best in others, withhold judgment, and ask questions for clarification (as opposed to making accusations). Do you take input personally or receive it as useful information? Finally, window people take a totally different approach to input and feedback. Because of their victim mentality communication is always personal, seen as an attack on them. As a result they feel compelled to fight or take flight. That’s what we do when under attack, right? The villain is either attacked in return or withdrawn from completely. Both destroys communication. A mirror person, approaching issues as a peer to a peer, an equal to an equal, doesn’t assign emotional meaning to a conversation. Input received, even if it’s about them, is a way to become more knowledgeable. And knowledge is power. As a result, a mirror person is able to communicate calmly and collaborate effectively because it’s not personal. It’s just information. How do you become a mirror person? Okay, how do you become a mirror person and not a window person? Recognize that we’re all born window people. We come out of the womb pointing our finger at others and assigning blame. It’s part of the human condition. We become mirror people by the choices we make. Here are two. In every circumstance you face, first ask and answer this question: Who am I? That is, look deep inside yourself and discover the values you embrace at the very core of your being. Define those values personally and live by them uncompromisingly. They are your moral center. Your rock. Your anchor. Secondly, ask and answer this next question: What do I do well? From your moral center flows a functional capacity for excellence. This is the unique ability you possess that allows you to thrive. It’s your personal tool box, a set of gifts and talents you can access at any time to solve pressing problems. These two dynamics, character and competence, are the choices you can make to become a mirror person. Character, your core values, and competence, your unique ability, clearly defined and consistently deployed allows you to control the one and only thing you can control in any situation: YOUrself. It seems that every athlete wants to be a rapper and ever rapper wants to be an athlete – at least this is the case for African American males. Athletes such as Ron Artest, Shaquille O’Neal, Allen Iverson, Kobe Bryant and others have tried to rap, and many rappers have played sports and decided it wasn’t for them (Shaq was actually decent). On the other hand, rappers such as 2-Chains, Roscoe Dash and others have had a short stint on the hardwood. I always wondered why this is the case? Maybe the rappers were undersized – most rappers are short – and maybe athletes’ word plays weren’t strong enough. One thing that’s for sure is that you can always catch rappers at sporting events and athletes at a hip-hop concert. Even in the film Brown Sugar, Boris Kodjoe’s character is an NBA player who is an aspiring rapper. In his song titled “January 28th,” J. Cole says “I turn the TV on, not one hero in sight, unless he dribble or he fiddle with mics.” I think the commonality between the African American males that rap and play basketball or even football, is their economic statuses. Consider the aforementioned athletes and rappers’ cultures. Each of them have tough backgrounds and have had to overcome some struggles, and they either had to rap or play their way out of their situations. Rappers talk about ball players in their songs and ball players are inspired by rappers by listening to their music before practices and games. It’s a strong connection because of the African American culture. It should not be the case – because there’s more to life than rapping and playing sports for males of color – but J. Cole has a point in saying that all of the rappers and athletes serve as heroes for young black males, mostly by default due to their status. Nevertheless, one basketball player who has been successful in articulating his lifestyle is Portland Trailblazer point guard Damian Lillard. He’s better than a lot of these rappers that are currently out. Check out the freestyle.